August already, I can't believe how fast the years go by, which means another new challenge over at Happy Little Stampers CAS, which for August is Masking. For this challenge, I decided to repeat a masking technique that Laura Bassen demonstrated on the 'Stretch Your Dies' course I attended earlier this year. First, I made a mask by die cutting a piece of acetate (so I could wipe it clean between colours) with a wavy edge border die. Then I used various colours of inks to sponge different colours down the front of a card layer. I overlapped some to make new colours by tilting the mask at different angles. Then spritzed it lightly with glimmer mist. 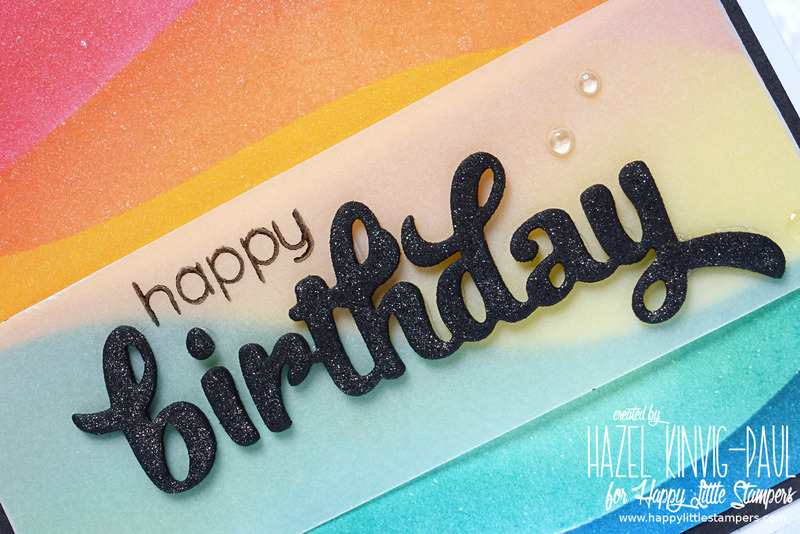 Next, I die cut the birthday word using a Reverse Confetti die, stuck it to a strip of vellum and stamped the word 'happy' above it in Stazon ink - as Stazon is the best for slick surfaces, like vellum or acetate. To finish off, I folded the ends of the vellum strip around the back of the panel and fastened it with Scotch tape at the back and mounted the panel on to another panel of black cardstock, leaving a thin border and finally mounted the whole thing onto a white card base, added a Wink Of Stella to the die cut sentiment and some Glossy Accent dew drops. 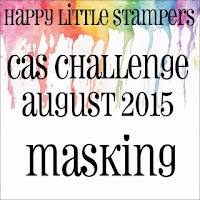 Do join us at the Happy Little Stampers CAS challenge and see the fantastic inspirational cards the other DT members have come up with and have some masking fun! Oh, wow! This is so so cool and beautiful. I love love love it! 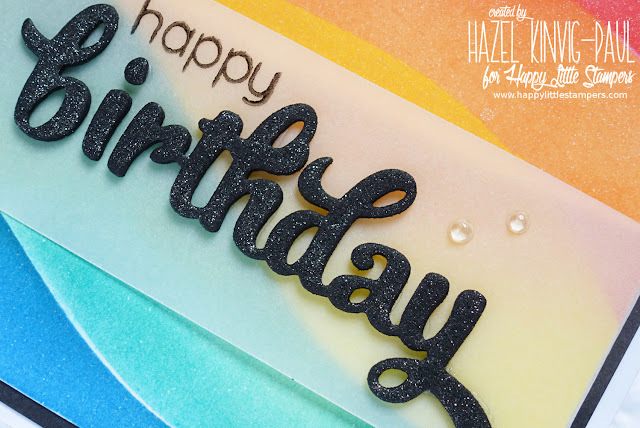 Rainbow, masking and sponging?! Wooo-eeee! As soon as I saw it I thought, "Bassen-esque!" Super! Those beautiful color waves totally make me swoon! Love that card! 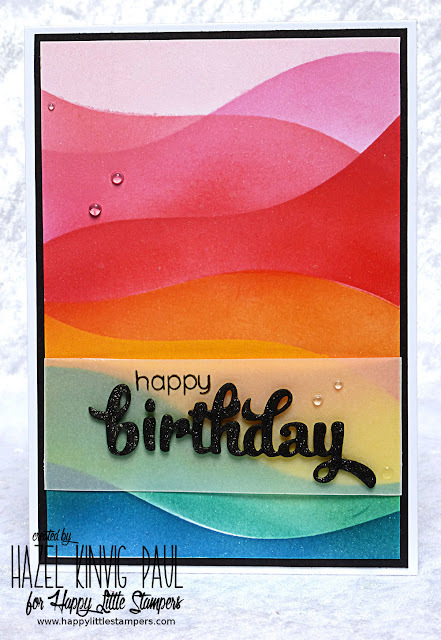 Great card to show off this masking technique. Love the swirls of bold bright colors, and especially liked the way you've done the glittering sentiment on the vellum. A wonderful & cheerful CAS card to demonstrate masking! TFS & Have a great week. Your rainbow colored waves really caught my attention. So beautiful and creative. Loved your vellum sentiment too. TFS your card and your steps. Love this card Hazel. Those waves of colour are brilliant. A true waauw card my friend. HAZEL!!!!! This is stunning,boy do I love that gorgeous background ! The waves look amazing! Well done friend! Awesome job! I really like the waves of color and your placement of the clear dots is wonderful. Hazel, I love this technique, your card is beautiful. Gorgeous inking and sparkly sentiment. I love this, Hazel, and am totally going to take a whack at this technique. Amazing amazing amazing!!! WOW, Hazel! What gorgeous colors and design! Love that stacked and winked sentiment too! Great job! This is amazing Hazel! I am in love with your sponged background! What a fun, graphic card! WOW, Hazel, your sponged bg is FABULOUS!!!! The colours are so beautiful!!! I really like what you've done here!!!! And the sentiment on the vellum strip and the few dewdrops are so perfect to finish it off!! Love the subtle shimmer!!! Beautiful, my friend!!!! LOVE it!!!! What a wonderful example of masking Hazel and I love the transparent look you achieved! The design is so modern and graphic looking and I love the sparkly sentiment. This is one amazing card Hazel...just so beautiful. And your birthday sparkle is so festive...just love it. 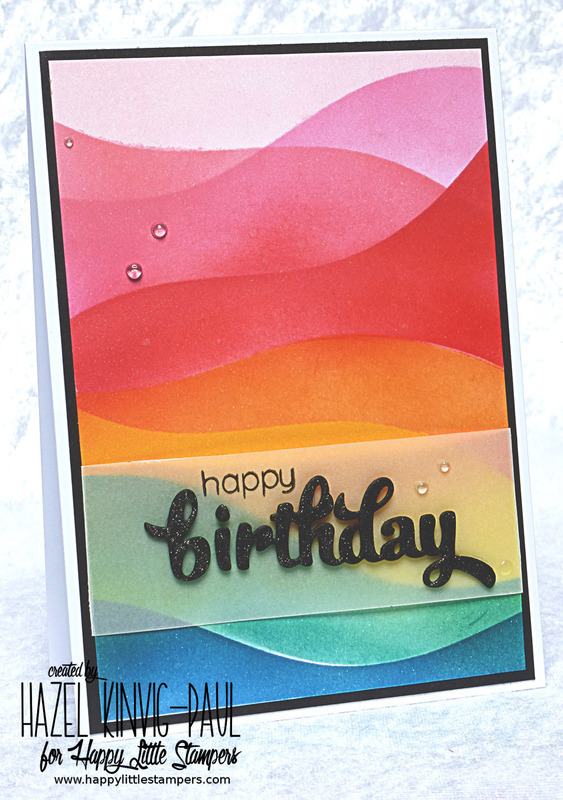 I just love the punch of colour this card gives...wonderfully done and so happy! OMG, this is amazing background, Hazel! Those cheerful colors and dimensional birthday are fantastic together! Such a gorgeous card and what a fabulous idea to use vellum to do the masking. Must try this out and see if I can get a card as wonderful as yours!! A perfect rainbow Hazel! So beautiful! I love the clean lines you have with this technique, even with the overlapping and your choice of bright colours are fab! What wonderful swirls of colour Hazel, so vibrant... and that sentiment is just terrific against them! Thanks for your kind comments on my blog. Love your card and the way you've overlapped the colours too. Very bright and cheerful! Hazel...this is GORGEOUS! I love the colors...and the blending looks perfect!